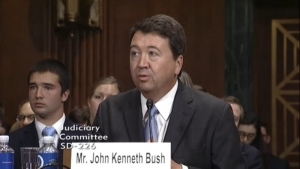 If you want to see and be profoundly depressed by the views of three of the men recently nominated by Donald Trump to the federal judiciary, check out the video of yesterday’s Senate Judiciary Committee hearing considering the nominations of John Bush and Kevin Newsom to be federal appeals court judges and Damien Schiff to be a judge of the U.S. Court of Federal Claims. Throughout the two-and-a-half-hour hearing, all three men — and particularly Bush and Schiff — go to extreme and downright laughable lengths to pretend that their past lives as right-wing advocates dispensing extreme views (Schiff called Supreme Court Justice Anthony Kennedy a “judicial prostitute” in a blog post) are completely irrelevant to their new gigs. “Here’s a pro tip. If you are a judicial nominee, and you have to spend much of your confirmation hearing denying that you endorsed birtherism, maybe ‘judge’ isn’t the ideal job for you. Bush — who, for years, played the role of loudmouth bully as an anonymous blogger, but in the hearing adopted the persona of a sheepish boy scout — even drew some mild rebukes from a couple of Republican senators. Senator John Kennedy of Louisiana told Bush “I’ve read your blogs. I’m not impressed.” He also asked Schiff to apologize for his attack on Justice Kennedy — a demand to which Schiff readily acceded. Meanwhile, North Carolina’s Thom Tillis seemed to send a couple of shots across Bush’s bow. 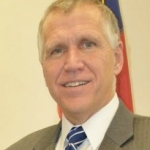 Tillis is 56. The nominee is 52. Tillis then tossed out the soft ball question: “Do you think that impartiality is an aspiration or an absolute expectation?” When Bush, rather surprisingly and clumsily said that he saw it as an aspiration, Tillis disagreed. Newsom was only too happy to avoid Bush’s blunder and parrot Tillis’ opinion. The committee took no action today on the nominations and Tillis gave no indication that he will do anything to slow them down. Let’s hope that Bush’s desultory performance causes the senator to show a little backbone on the matter. Click here to check out the hearing. Tillis shows up around an hour and 37 minutes in.